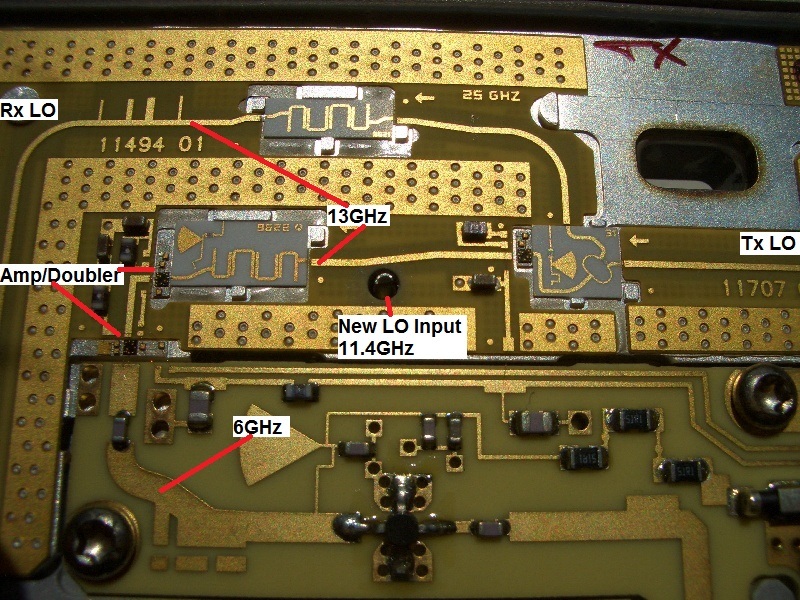 June 2013 - First experiments with 24GHz! 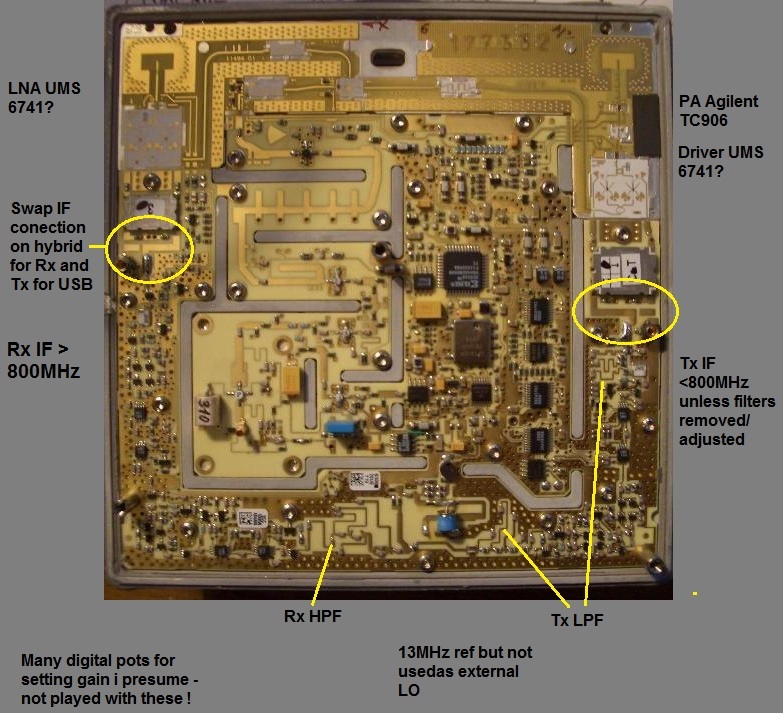 A long time ago... well a few years ago anyway, i purchased a 25GHz Alcatel 'Radio Termination' unit off ebay for next to nothing. When it turned up i found it was very well sealed with some sort of epoxy resin on all screws and the only way to remove it was to heat it up, a nasty smell came with this process so it was done outdoors! 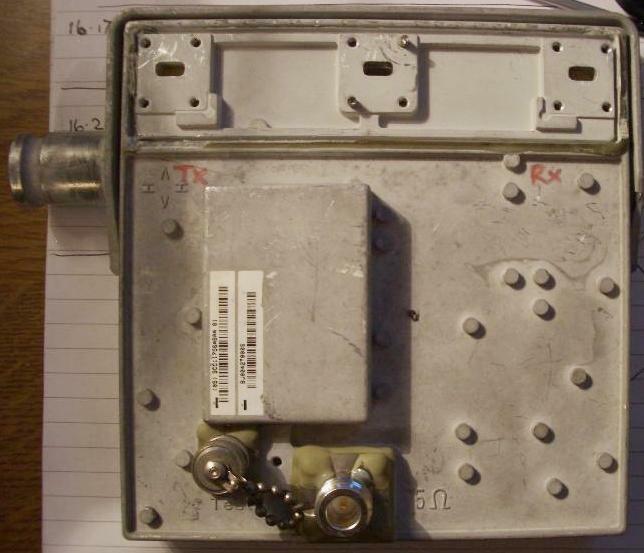 I currently have a few Elcom 11.2-12Ghz synthesisers laid about pending 10GHz projects, one of which has been used as the 1/2 LO source for the 24GHz unit. 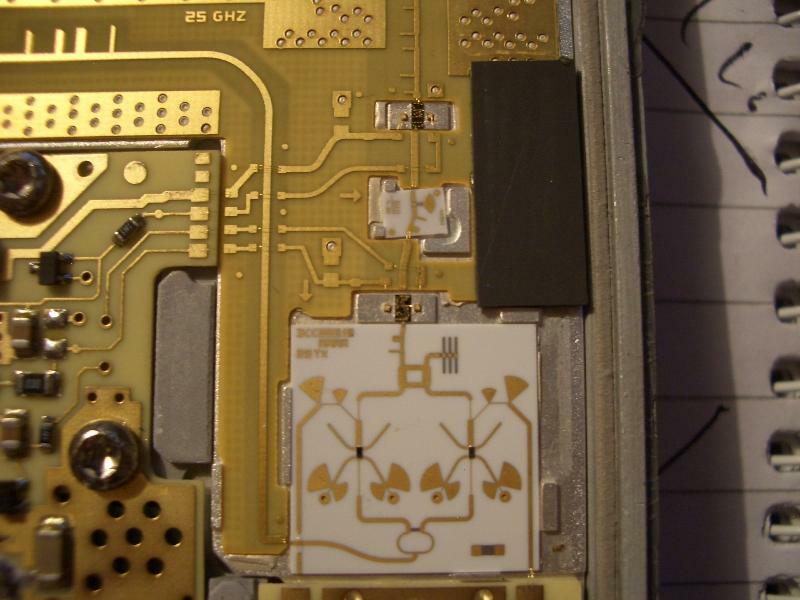 The internal ceramic resonator was only tunable by some 20MHz at 3.3GHz so was not any use and when running (with pll lock) gave a very rough tone when tested on receive in it's original 25GHz operation. The 3.3GHz is doubled and then doubled again to get 13.2GHz, instead I'm feeding in 11.4GHz (from the Elcom Synthesiser) after these two doubling stages just before the LO splitter. The oscillator was disabled by removing the drain on the oscillator FET but remaining amplifiers left powered up.. no instability seen so far but they could be disabled too. The mixers work in sub harmonic mode only requiring 1/2 LO frequency to operate, 11.4 x 2 = 22.8GHz. The tests after this was done give a really clean tone at 24GHz when compared to the original LO setup. The Rx IF is 800MHz up over, Tx IF is below 800MHz due to filters in the IF path for 'normal' split freq operation of the unit, i have removed the Tx filters for now to test at 24Ghz with the IF on 1248MHz. Rx and Tx gain can be controlled by the various Digital pot's on the board but i have not looked into these, more than adequate gain was found on Rx and Tx. Both the Rx and Tx paths are operational at the same time which may have to be altered to stop self oscillation when using the same IF for both. The RX in the unit is 3 stage device UMS part no. 6741 but i cannot find any info on the net about it's spec. 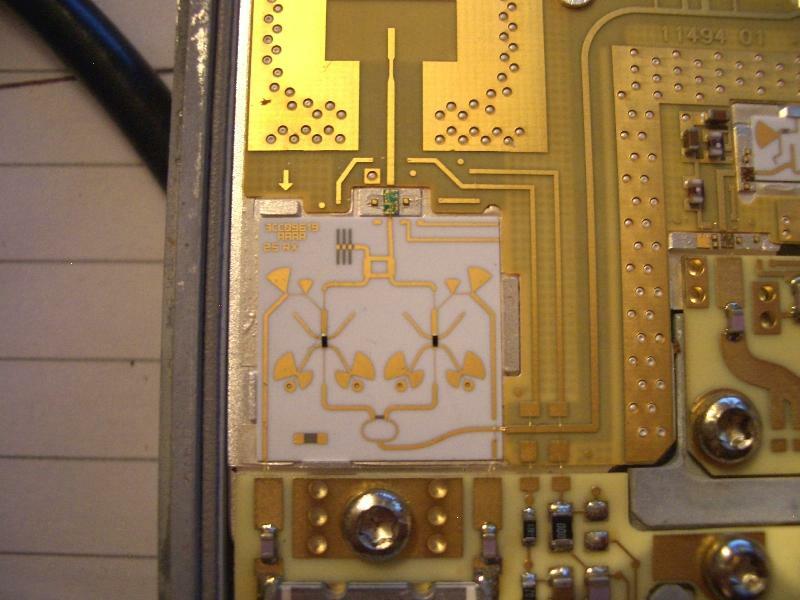 The PA is a TC906 (HMMC5040) which there is information for, P1dB of 18dBm which is not too bad start at 24GHz. The PA driver stage is another UMS 6741 device, anyone have any info on these? The unit is powered off >16v supply at around 600mA, designed for 24v. down conversion of 16KHz at 24GHz and surprisingly stable, these have an internal 10MHz oscillator that can be trimmed or run from a separate 10MHz reference. *note I am using the ILCDFSL-1202 model, other versions of the Elcom synths have different reference frrequencies. Here is the new LO input method, you need to cut the track where i have fitted the sma connection hole. I used a 3p3 cap to connect sma pin to the track heading to the amp then splitter, about 5mW input seems to be enough. I have also built a 25dB horn from double sided pcb which seems to work well, cold sky to ground measurements with this setup seem to be in the region of 1.2dB at 24.048GHz, this calculates to about 6dB Rx Noise Figure. Next thing is to try and receive GB3MAN beacon, the 10G one at the same location is audible with me all the time at 110km over the top of the pennines but not strong, I'm guessing the path needs to be some 20dB up on normal to have a chance of hearing the 24G beacon...we shall see in time but rain scatter seems to be the best chance from home unless i use a big dish!